Okay — nobody’s perfect. Including me. 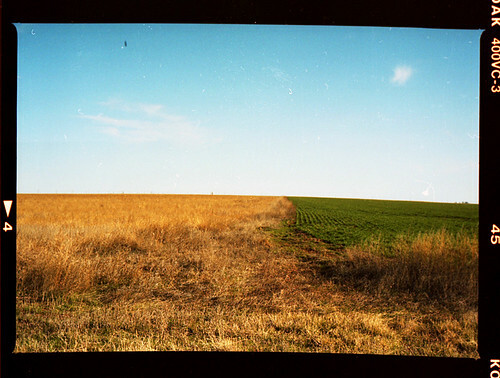 These two frames were supposed to show the flat Oklahoman landscape from the view of the road, but I severely underexposed the first frame and then bracketed in the wrong direction for the second. Oops. But these are the only frames I exposed incorrectly during the entire trip, so I’m fine with that. It was not uncommon to see how distinct the irrigation lines are. Portra 400VC, 120mm. 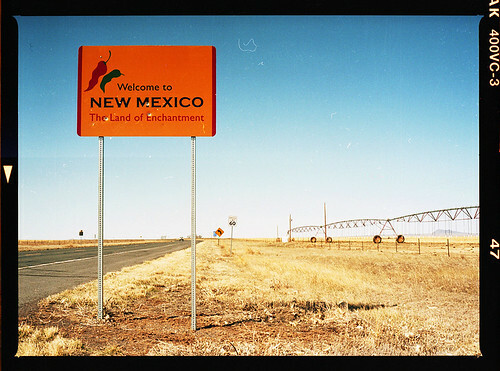 On the second day of our roadtrip to Santa Fe, Jeff and I were out of Oklahoma by probably 11:30ish a.m. CST. Crossing the border meant we gained an hour and lost about 10 miles per hour in the speed limit. Ya lose one, ya gain one. On US-412, leaving Oklahoma. Portra 400VC, 120mm. We arrived in Cimarron, N.M., at about noon local time. I showed Jeff around town a little bit before we met up with a friend of mine who’s working at Philmont Scout Ranch in the off-season. He gave us a tour of the camping headquarters, which has changed a bit since I last worked at the ranch in the summer of 2008. There have been quite a few changes especially in my old office, the News & Photo building. The photo department has been digital since my second summer working there (2007), but now nearly all signs of film production are gone. The dark room no longer has a negative-drying closet or the JOBO processor, all the Pentax 6×7 bodies and lenses were removed from the safe, there was no film left in the refrigerator. This was slightly heartbreaking. 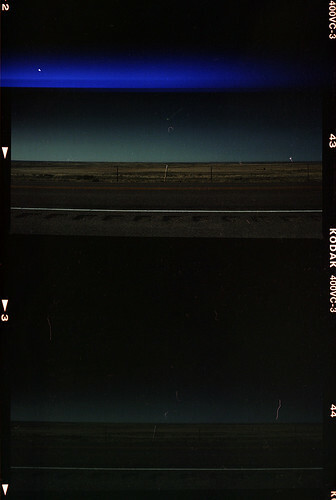 It was at Philmont in 2006 that I’d learned how to use an SLR camera, how to expose manually, how to process and print film, how to make good pictures. I wouldn’t be in photojournalism today if not for my trial-by-fire, steep-learning-curve experience at Philmont. Sure, the times are a-changing. But in photographing this spring break trip entirely through film, I wanted to give a nod to the place where I first really fell in love with photography. As for the title of this post? Well. It ain’t windy just in Oklahoma.